Have you been following along with our Baker's Dozen promotion this summer? Each week, half of our designers will put up one of their favorite products as part of that week's Baker's Dozen, and best of all, those products will be 50% off until our new releases go live each Friday evening at 6pm! This week, I'm putting my I Need A Hero Bundle into the spotlight. It's no secret that my family loves super heroes (spoiler alert - stay tuned for this Halloween to see the Pritchett family costumes!) 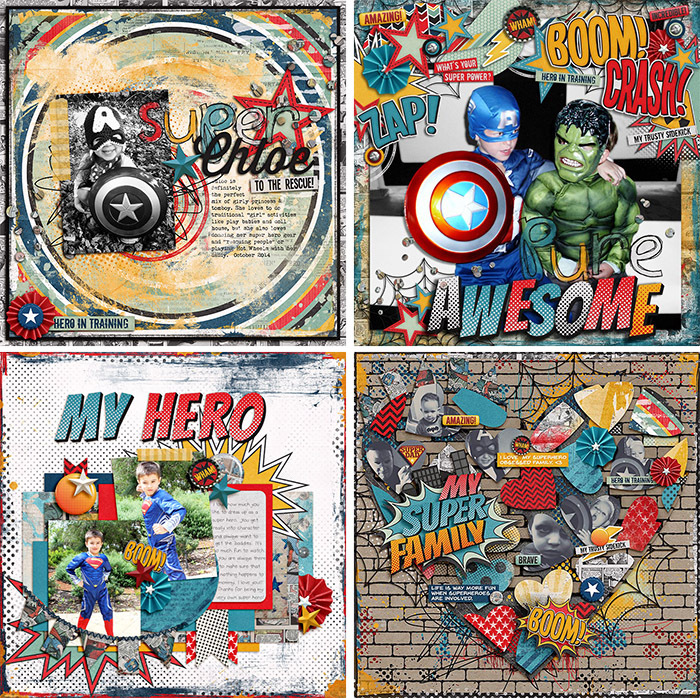 So, a couple of yeas ago, I had the idea to do a super hero kit with a vintage vibe. I loved the way it turned out, and even today, it's still one of my favorite kits. To make this deal even sweeter, the 50% Off for the Baker's Dozen discount is on top of the already-discounted bundle pricing! These products would retail for $11.98 separately, but this week only, you can grab the bundle for just $5!